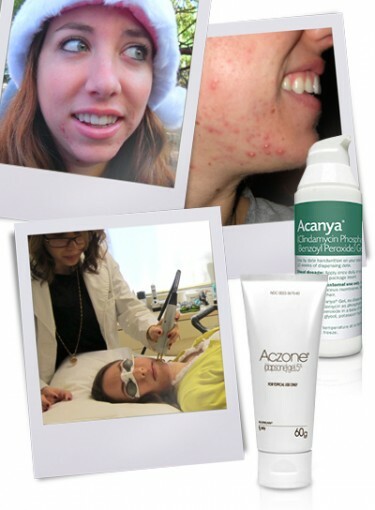 Follow Claire's journey as she attempts to get rid of her cystic acne. Was she able to find a cure? Every morning, I look into the mirror, and my heart drops. Staring back at me is a 25-year-old woman whose face is covered in bright red pimples and inflamed cysts. Even though it’s been years, I still cringe at the sight of my skin … and then I force myself to wash my face and get dressed, even when I feel like crawling back into bed and hiding under the covers. I tried everything to get rid of it. Oral medication just made me feel bloated and hormonal. Proactiv didn’t get rid of a single pimple. The ONLY time my acne got better was when I started Acutane (a pill-version of retinoid, with very risky side effects). The forehead acne disappeared, but nothing happened to the pimples around my mouth and chin. After I was done with Acutane, I started taking Spironolactone (an anti-androgen that helps regulate hormones) in addition to birth control pills. This helped with the acne around my mouth, but not much. That’s when I decided I didn’t want to be taking pills for the rest of my life. I was sick of filling my body with meds, and felt so frustrated I still had daily breakouts. For the last two years, my current “regimen” has been washing my face with a salicylic acid cleanser. And that’s it. My boyfriend, Ben, tells me he loves me no matter what my skin looks like. But I’ll admit, sometimes I doubt that. And either way, I know I won’t really feel good about myself until my acne is gone. It’s time to do something about it. My last-ditch effort is a big one. I’ll be working with Dr. Ava Shamban, M.D., owner of the Laser Institute-Dermatology in Santa Monica, Calif., to try to cure my acne once and for all — and I’ll be sharing every step of the way with you. Why Shamban? She’s the celebrity dermatologist on “Extreme Makeover” (and author of “Heal Your Skin”), and lucky for me she gives women those same treatments off-camera too. I’m willing to do anything to have her treat me — even if it means taking pictures of my bad skin and putting them on the Internet sans Photoshop. Desperate? Maybe just a bit. Keep reading to see what happens next in the journey to cure my cystic acne and stick around for the end, when I share how you can do (almost) the same thing at home.